Three cheers for everyone who entered the very first Ironcraft! 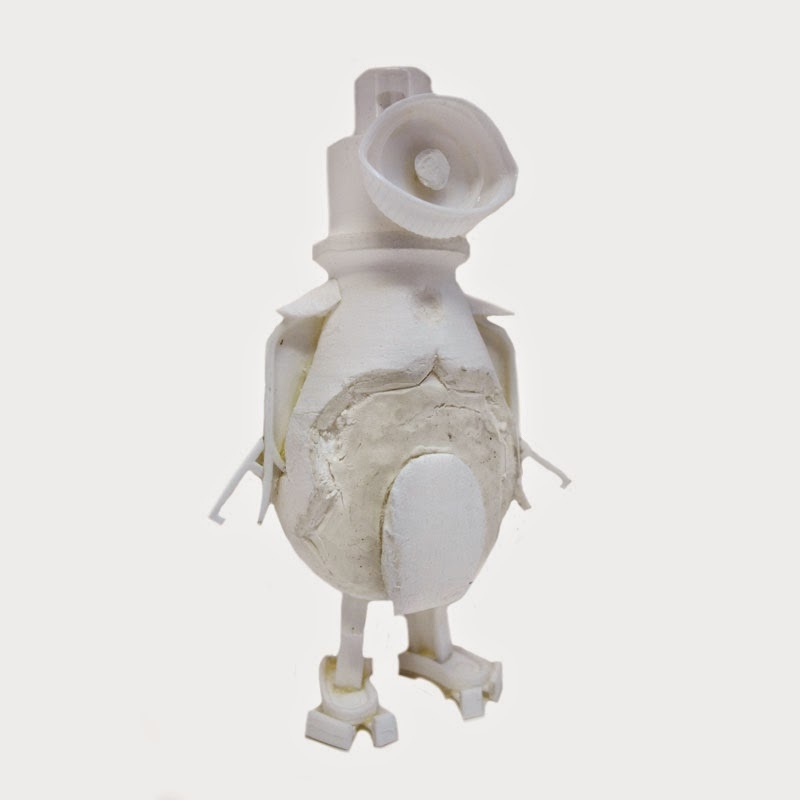 We received 27 entries in person and via email, and the imaginative creations blew us all away here at the shop. For those who didn’t take part this time, let me show you the mystery item all Ironcrafters received. 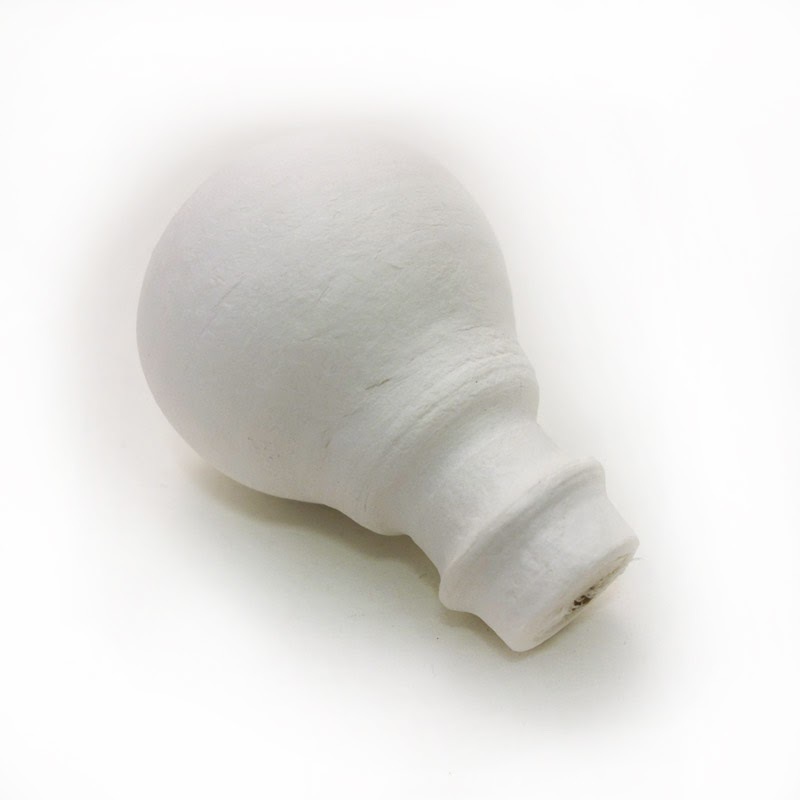 This bulbous spun-cotton shape was given to each participant, who then took it back to their home studio to turn it into something magical. Some people gave the mystery item a personality, using it as the head or body for incredible dolls. 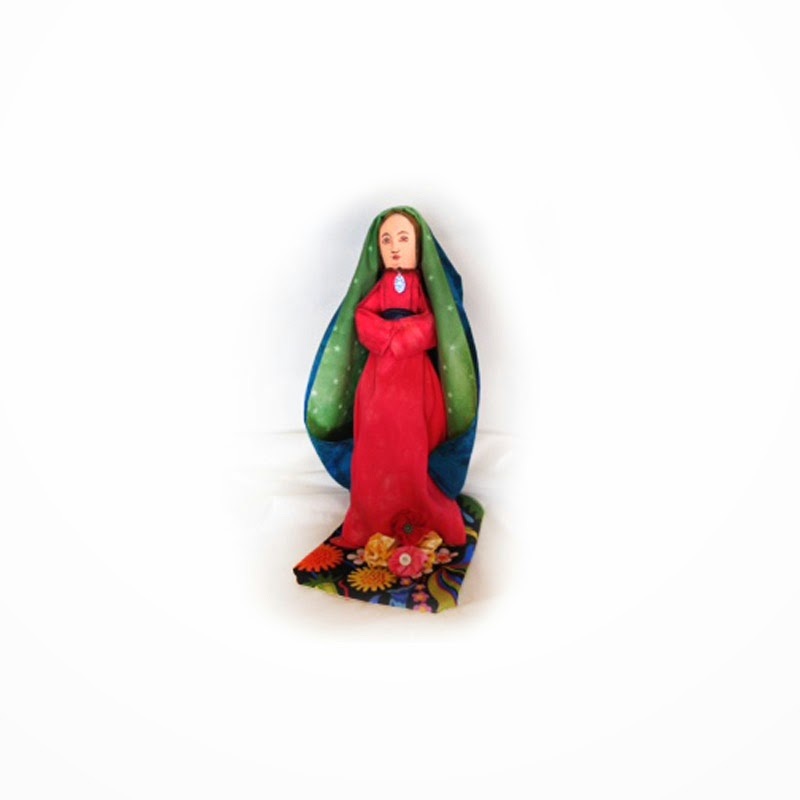 Our popular Santos classes even got a nod, with a few entrants hollowing out the doll’s torso to hold tiny wonders. My own thought, when I first saw the mystery item, was that it could be a hot air balloon. Everyone at Castle in the Air has a love of airships, obviously, and we did get a few entries along those lines. The aerialist theme was especially appropriate this month, because one of our class teachers, master calligrapher Bill Kemp, took to the skies for the Albuquerque International Balloon Festival. Now we have a fleet of our own! Ironcraft isn’t a competition, unless you think of it a challenge for your imagination. Everyone who entered is a winner. As the Castle crew marveled at the incoming entries we all felt like winners, too. Intention, skill, and imagination shine through in each entry, and the commitment it took to send us the finished artwork (or a picture of it) fills me with joy. 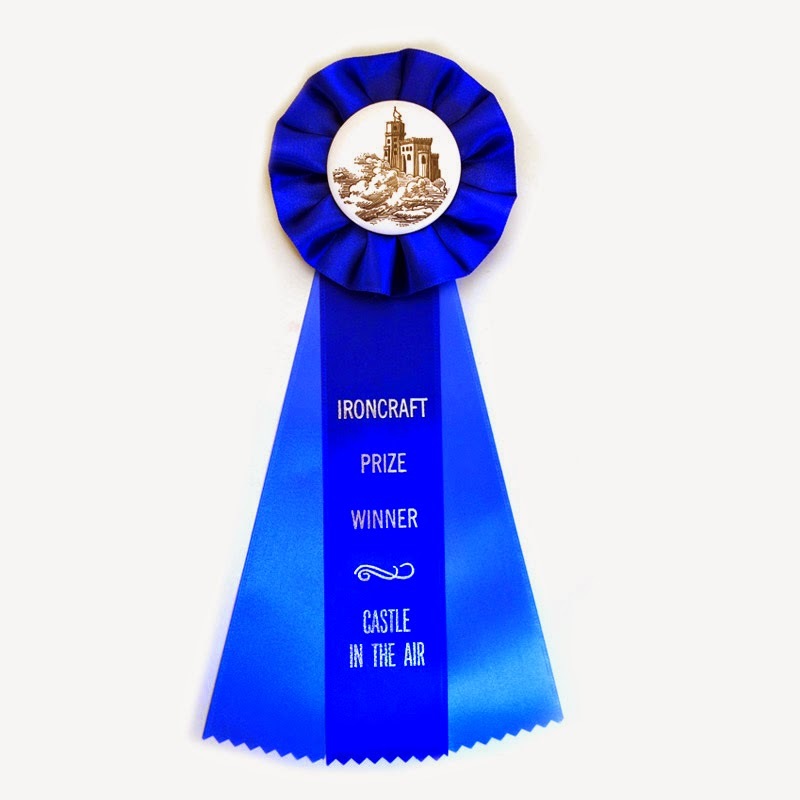 If you participated in Ironcraft and gave us your postal address, then you can expect your prize soon. In the meantime, I hope you take pride in your work. Show it off! Maybe we can revisit Ironcraft in the new year? What wonders flowed into Castle in the Air in response to our first Ironcraft challenge! The entries came in all shapes and sizes, and showed such effort and imagination. The entry window is closed, and we’ve done our best to ensure that every entry we received is represented here. If you sent us yours and don’t see it, please let us know. We’re floored by our community’s creativity—take a look! 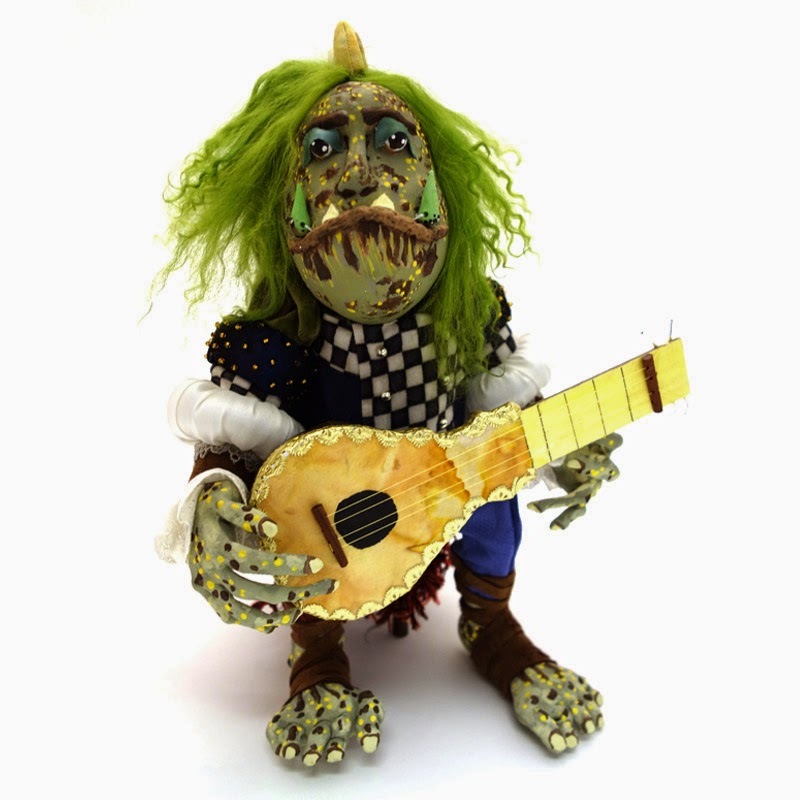 Hooray for musical ogres! Carl’s mandolin is tricked out with Dresden trim, and his puffy Renaissance sleeves lend him an air of sophistication, not that this good-looking fellow needs any help with that. 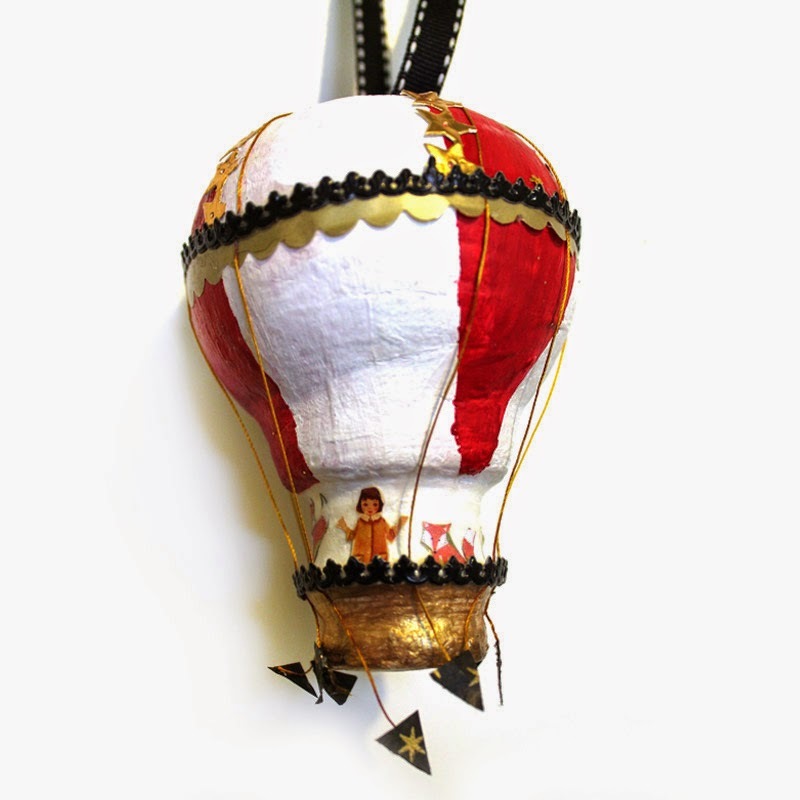 Carmen’s hot-air balloon is busy setting a land speed record with the help of no fewer than eight tandem cyclists. We love the ballast bags tied to the basket! Between her serene countenance and somber clothing, it would be easy to think that Esmerela has settled down for the Big Nap, but her note assures us otherwise. We hope she wakes up soon so we can ask her where she got her cool boots. Where do you keep your fairy dust? 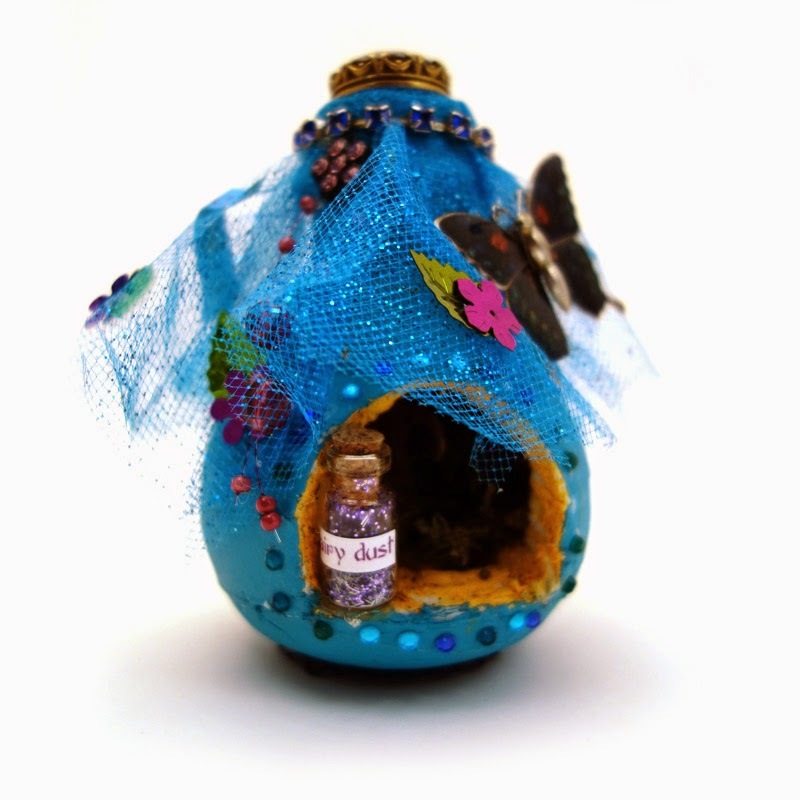 This fairy keeps it on her windowsill to share with the local butterflies, who are no doubt attracted to the other bits of bling encrusting this scrumptious fairy nest. The Aurora Rose takes flight under Captain Clayson’s able hand. Check out the cotton batting smoke rising up to fill the balloon! The detail in this giant piece is incredible, right down to the Dresden edging and the miniature family portrait. Viva vintage toys! So many from my childhood are making a comeback, including this familiar face. Mr. 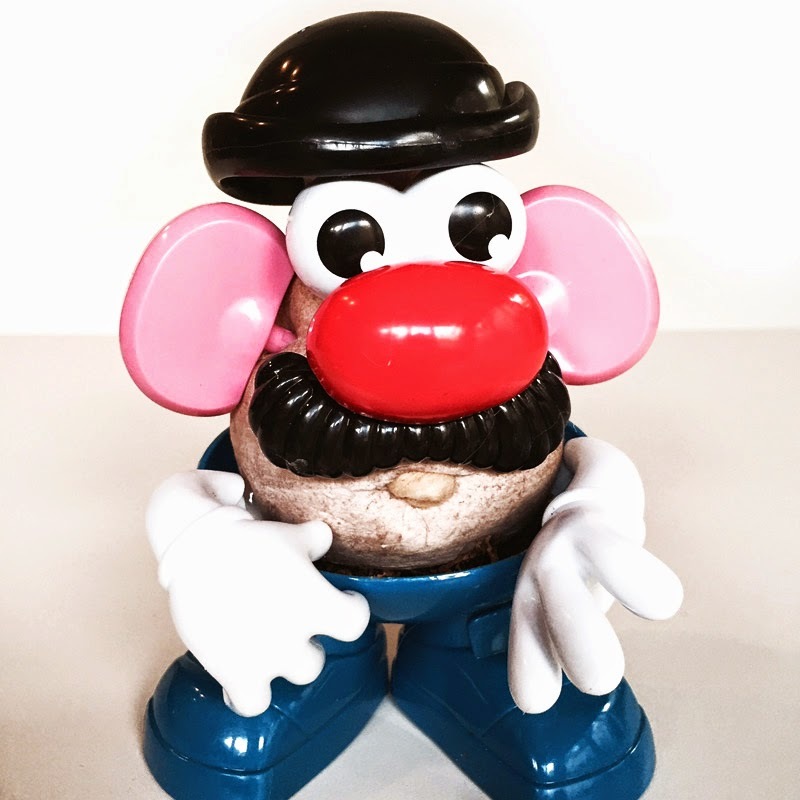 Potato Head had better hide from our calligraphy teacher Bill Kemp, who is famous for cleaning his pen nibs by sticking them in a spud. 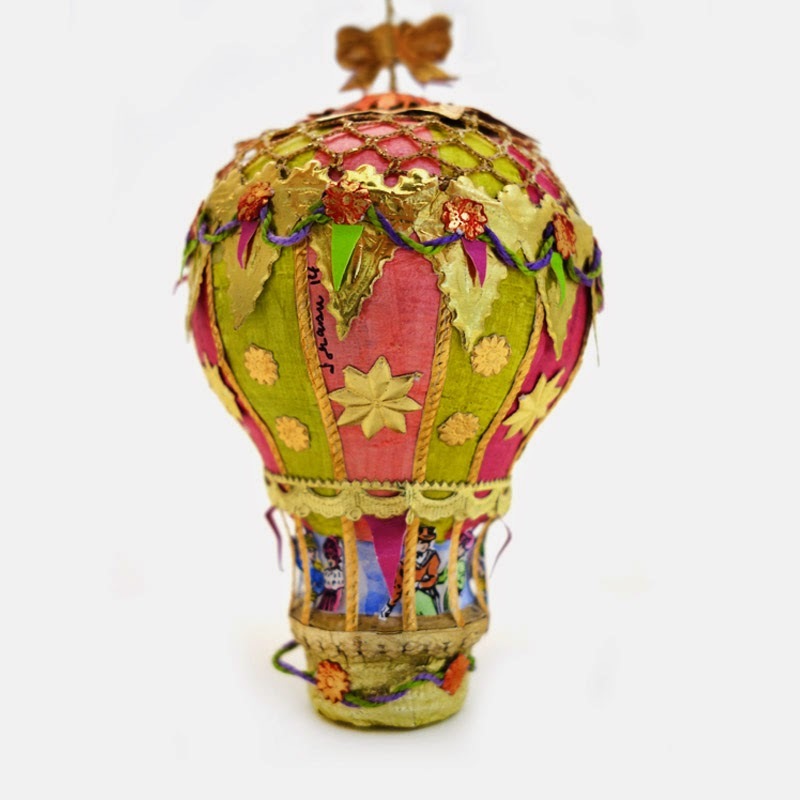 Nysa’s festive balloon lifts our spirits with its bold colors and high-contrast background. 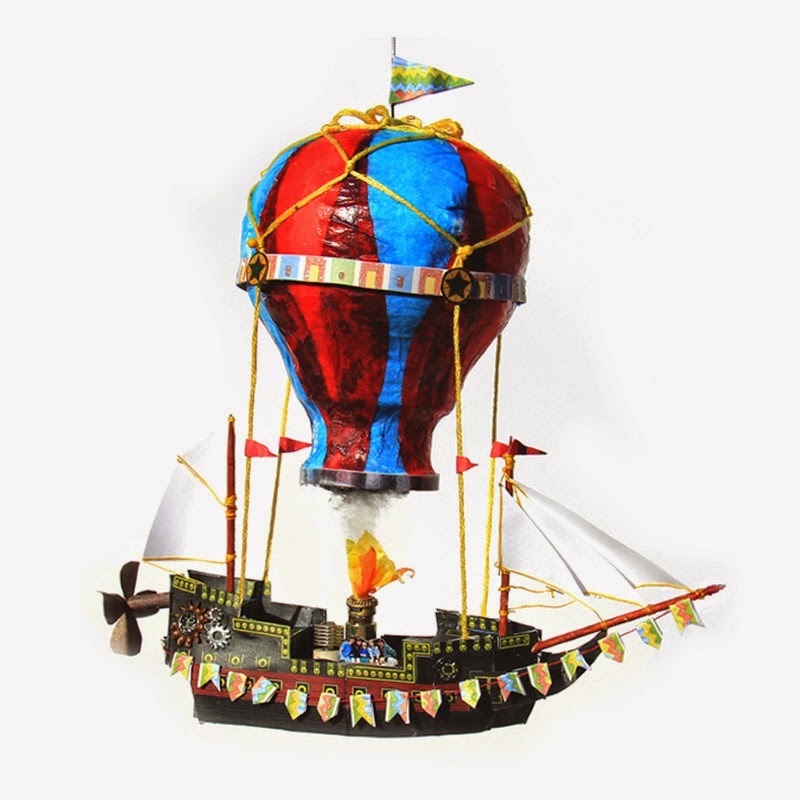 The flag-waving pilot reminds us of the etchings of the famous early balloon flights of the Montgolfiere brothers. 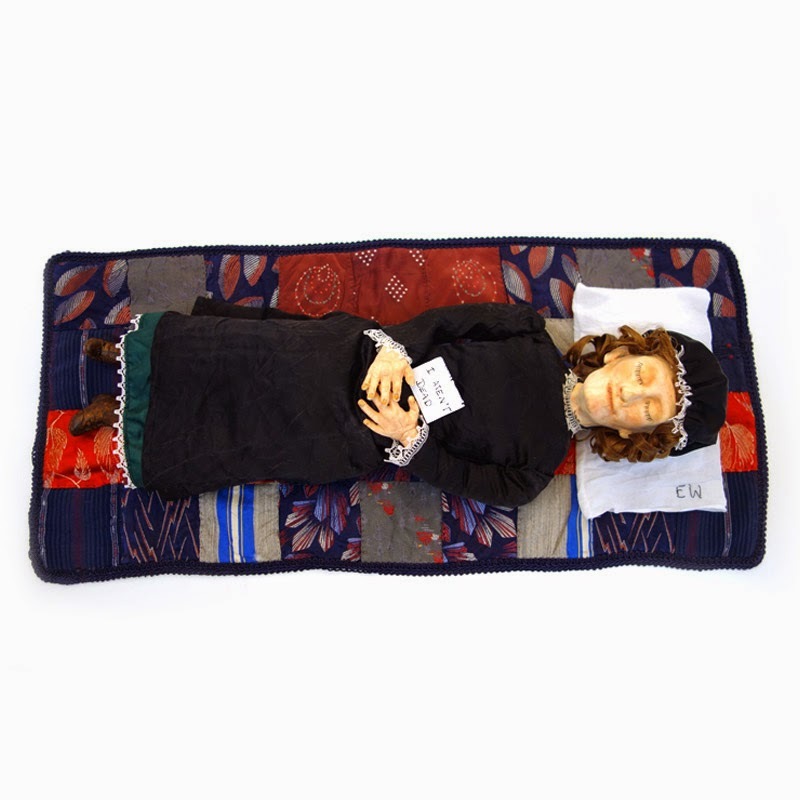 Margaret is known for her friendly peg dolls (we’re looking forward to her next book of them, out this December), so we’re thrilled she made a bigger figure out of our mystery item. Love the knit cap and the lantern—let it shine! Sometimes animals get conscripted for aerial adventures (one of the earliest hot-air balloon flights was “manned” by a zoo crew including a sheep, a rooster, and a duck), but this time it seems the flying foxes have persuaded a girl to come fly with them. Imagination just drips from this piece from Mary Dupen, with its brightly colored flying boat and its hard-working crew lassoing the stars. All the gold makes this balloon extra-celestial. Jeanie’s doll reminds me of eastern European figurines for its use of velvety fabric and its nesting-doll style painted face. 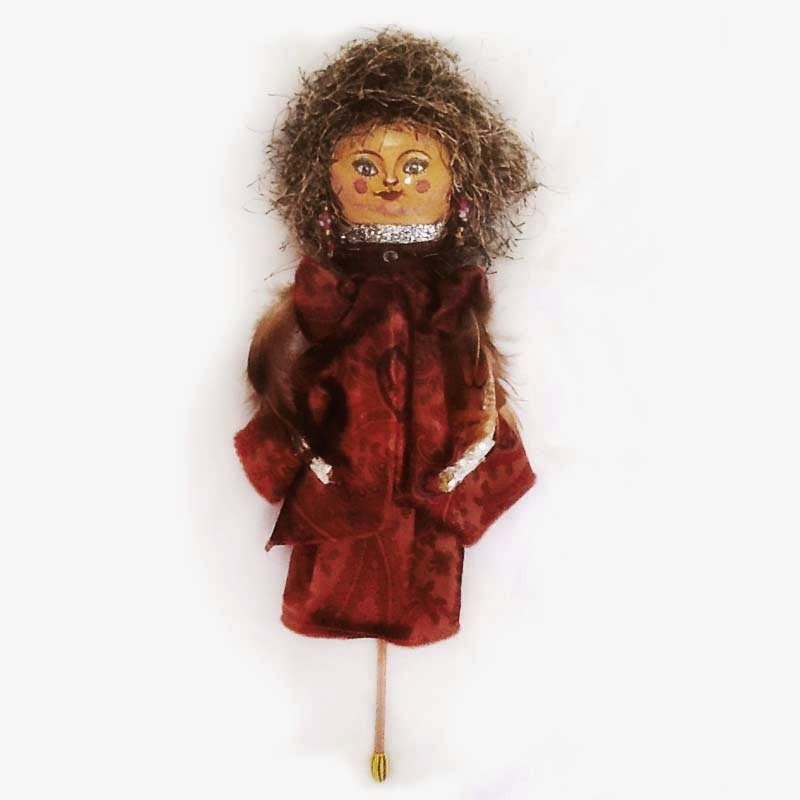 She affixed a stick to the base of the doll, making it into a perfect actor for a puppet show. Pastel colors and Dresden trim help take Meredith’s balloon over the top. The gold netting and encircling pink and green pennants are adorable touches. 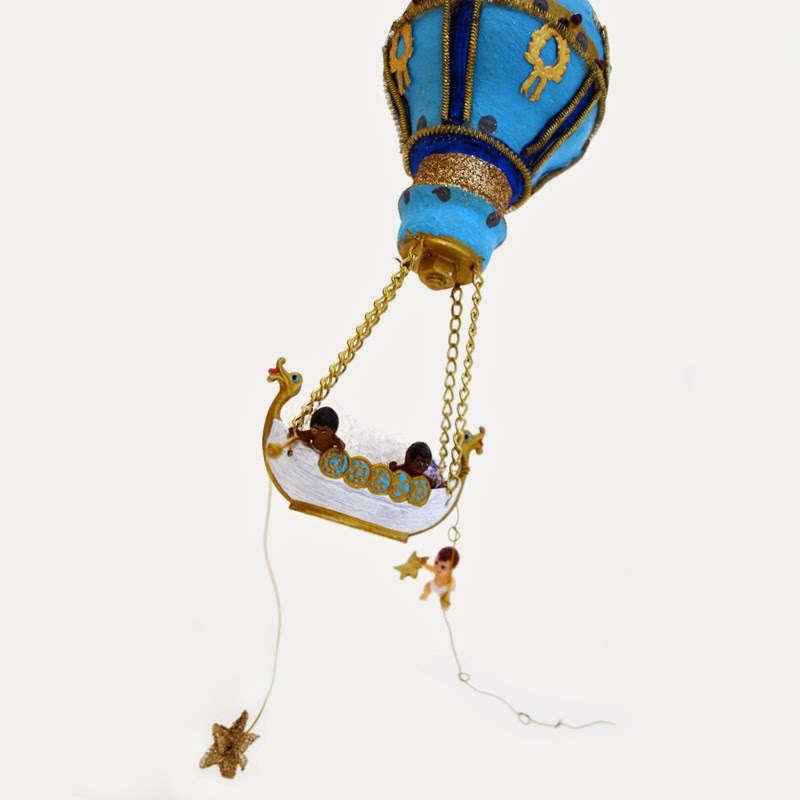 We would love to be part of the celebration aboard this airship. Where can we buy a ticket? Elizabeth adorned her mystery ingredient with thin strips of Castle in the Air’s crepe paper to create a black, gold, and white tassel fit to adorn a queen’s bedstead. 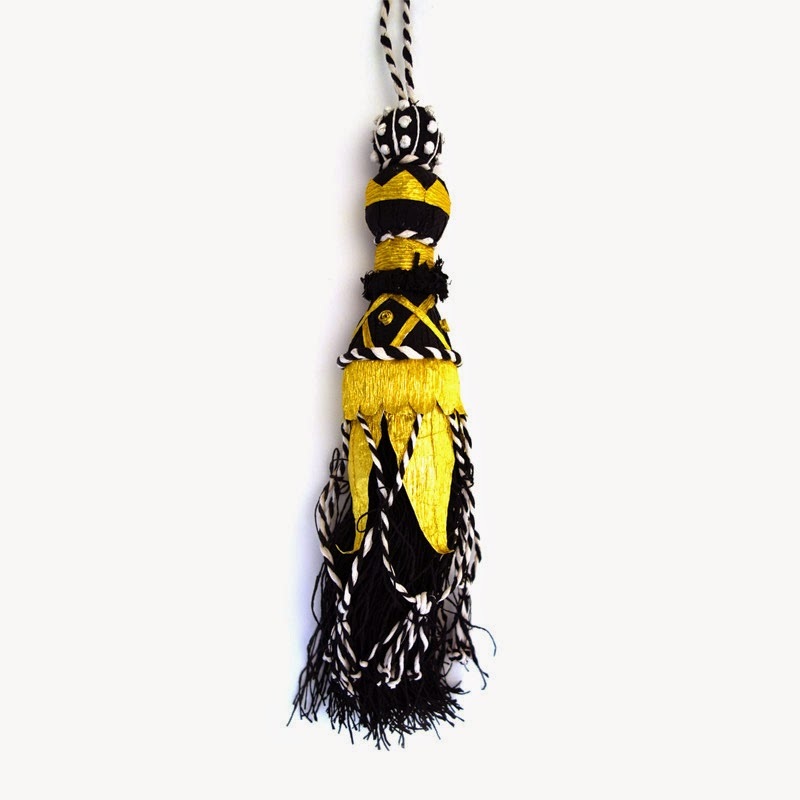 She included a lovely written history of the tassel with her piece, from which we learned that at the height of their glory tassels decorated everything from ladies’ shoes to the throne of Emperor Napoleon. 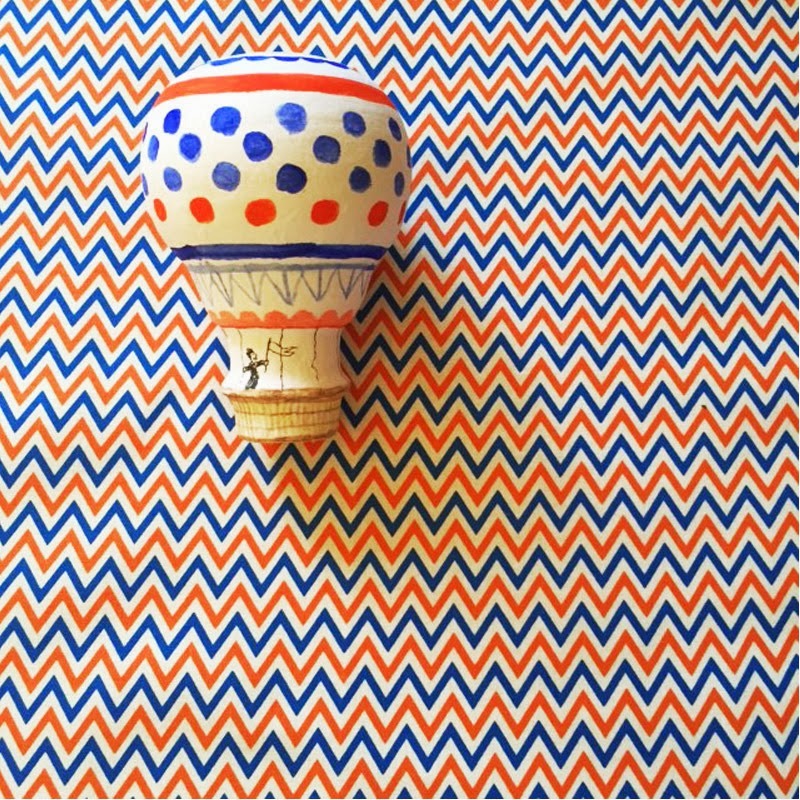 “Ice Cream Cone,” by Raphaella Hero. Sweets for the sweet! Visions sugarplums dance in our heads when we take in Raphaella’s double-scoop cone, which is complete down to the sprinkles and the waffle texture. 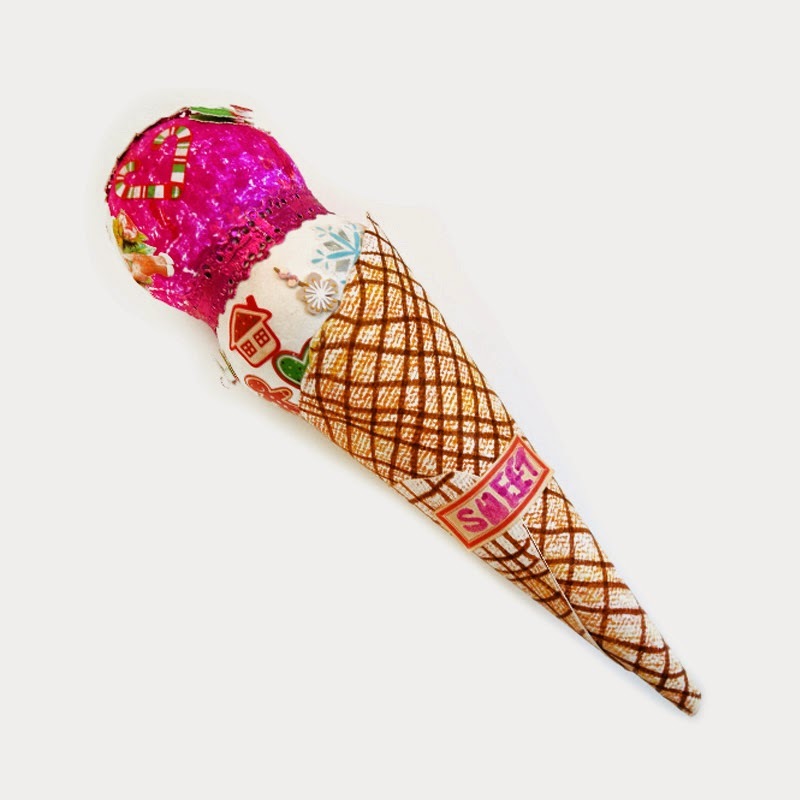 We love how the pink lace makes the ice cream look like it’s just begun to melt. 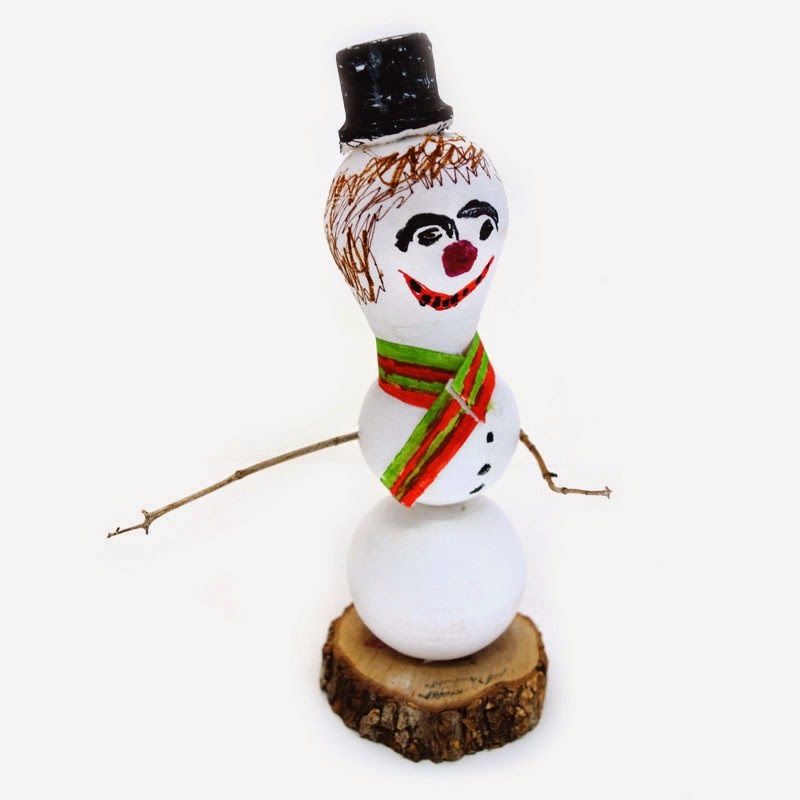 “Snowman,” by Valentina Sa’ida. More is more! 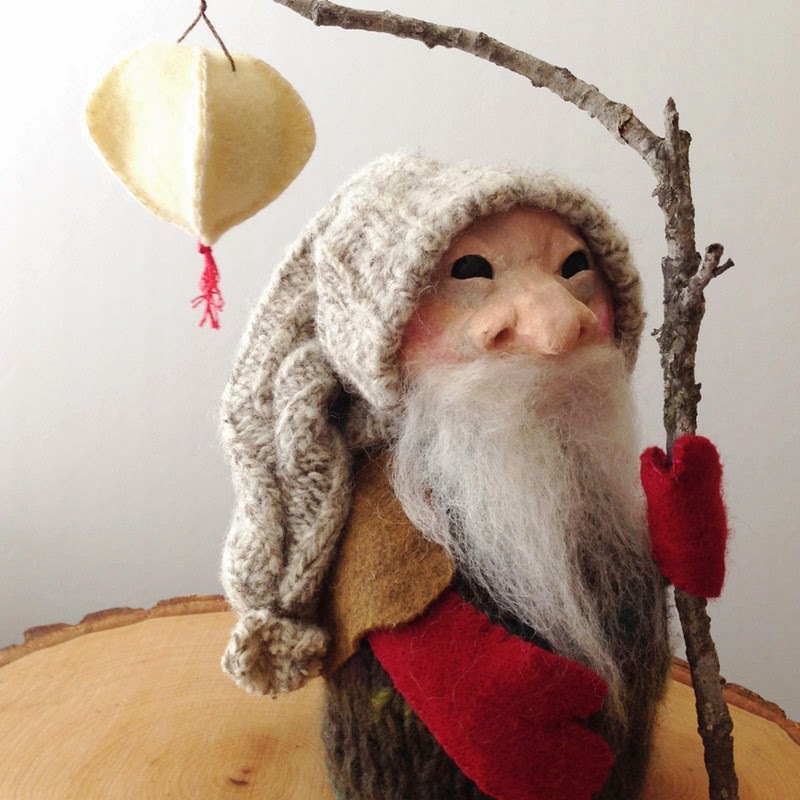 Valentina stacked extra cotton-batting orbs beneath her secret ingredient to make this jolly fellow. We never get snow in Berkeley, which is why we were excited to get this early glimpse of winter wonder. 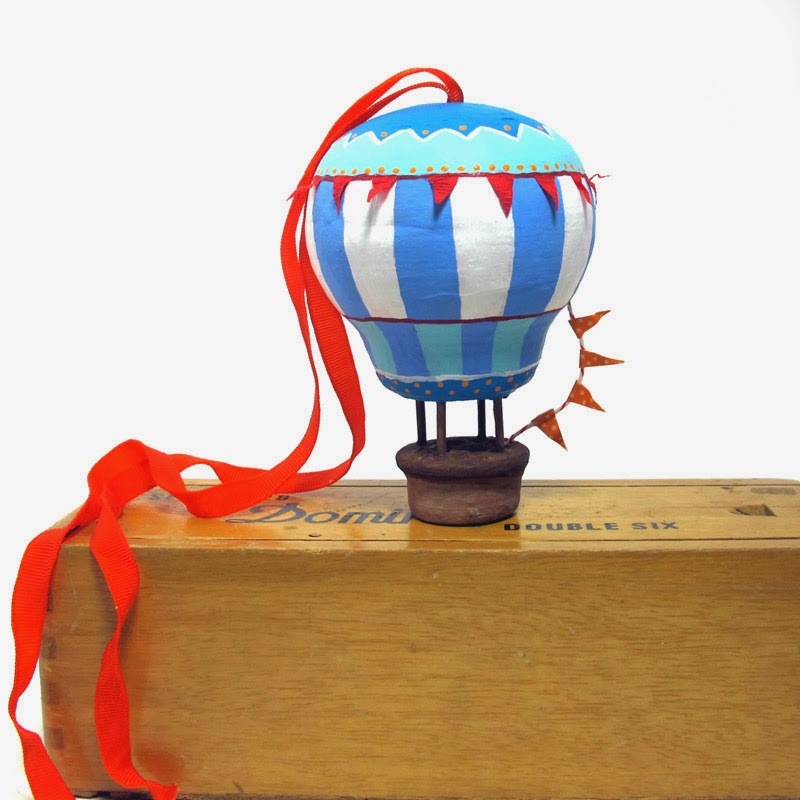 Phoebe regularly wows us with the inventive figures she makes in Castle in the Air classes. Where do we start talking about all the fantastic details on this guy? 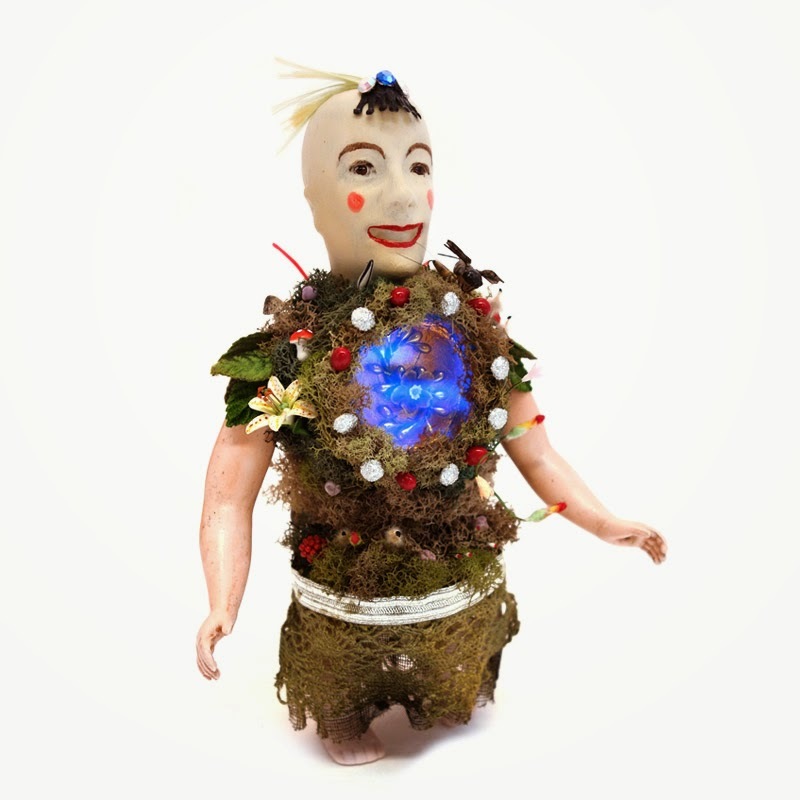 The iridescent glass in her doll’s torso makes it look like he’s glowing with life’s spark. Ruth captures the spirit of the season with her lovely skull figure. From its wise eyes to its ornate gown, this figure seems to know something about eternity. The creases in the aluminum crepe perfectly evoke the folds of fabric at this scale. Divine inspiration! 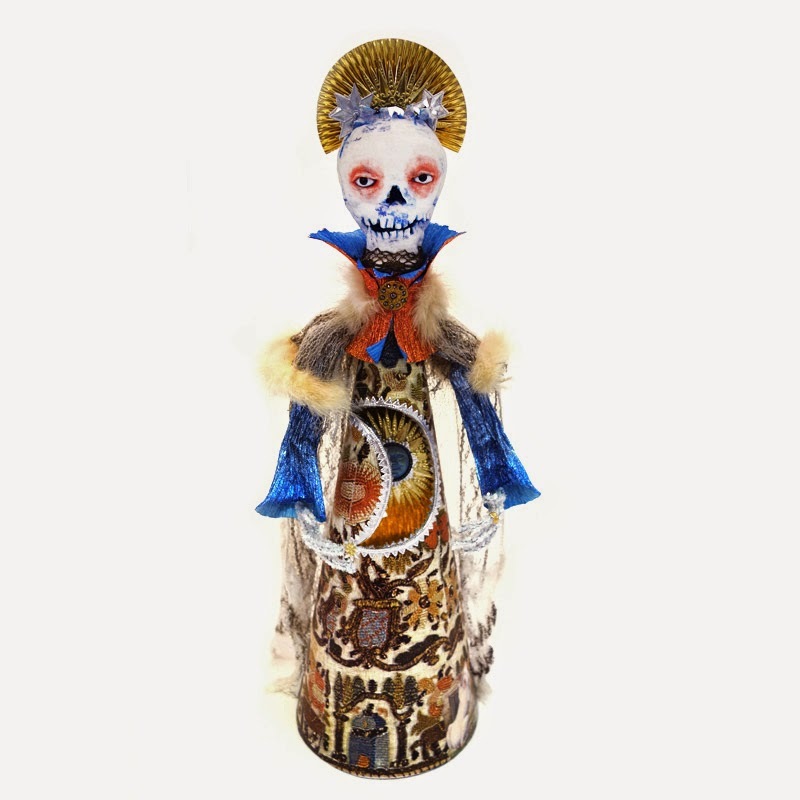 Heather’s contemporary take on a saint figure is worth praying to when you need a project’s pieces to come together, and proves that we often have what we need close at hand. April’s entry literally turns the dollmaking concept on its head, using the “neck” of the mystery ingredient as a snout for a canine housewife. 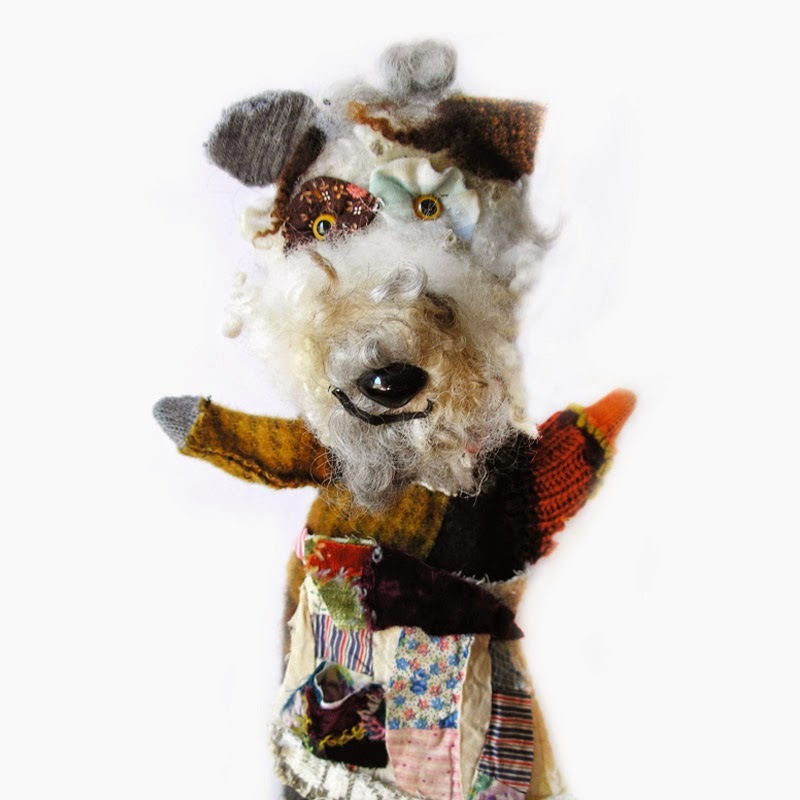 The shaggy fur, bright eyes, and patchwork dress charm us to no end. 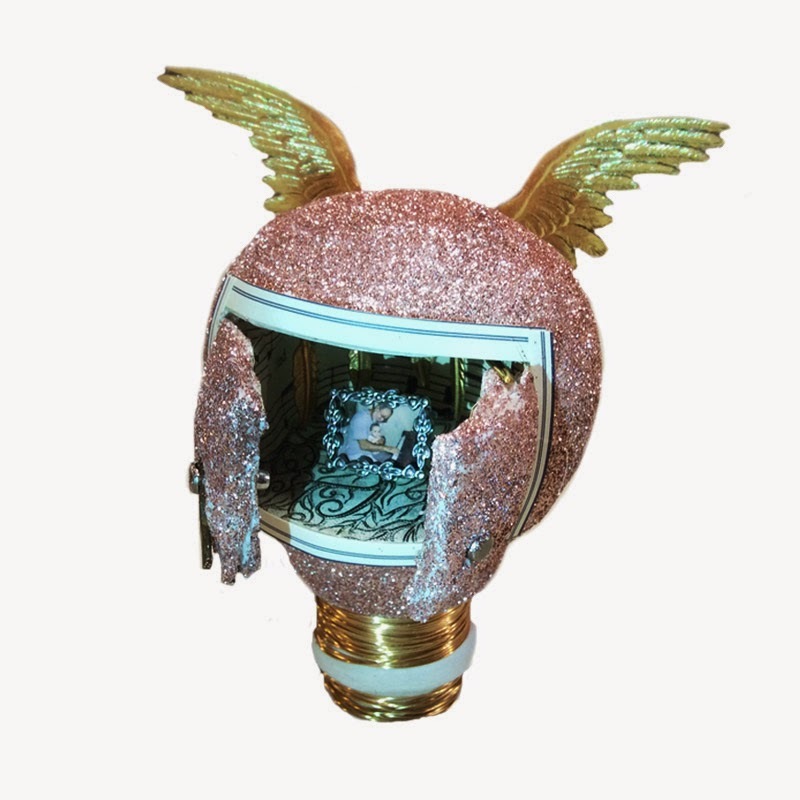 Julie’s winged “Lightbulb Shrine” flew in like a fantastic bird from the wilds of Mendocino County. She tells us she created the shrine for her father and daughter. We should all be so lucky to be immortalized in such a gorgeous way. 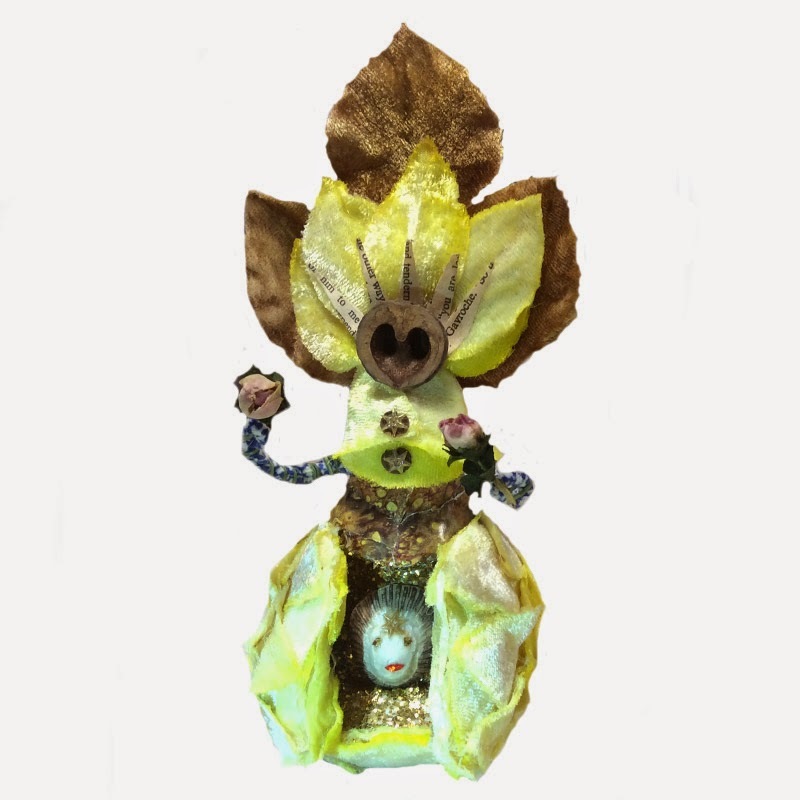 Susan crafts her creations from her wondrous Boonville “art barn.” She pried open the mystery ingredient to reveal the fairy baby inside. The velvet leaves and snippets of text (is it from Pirate & Hoopoe?) emanating from the top are inspired touches. 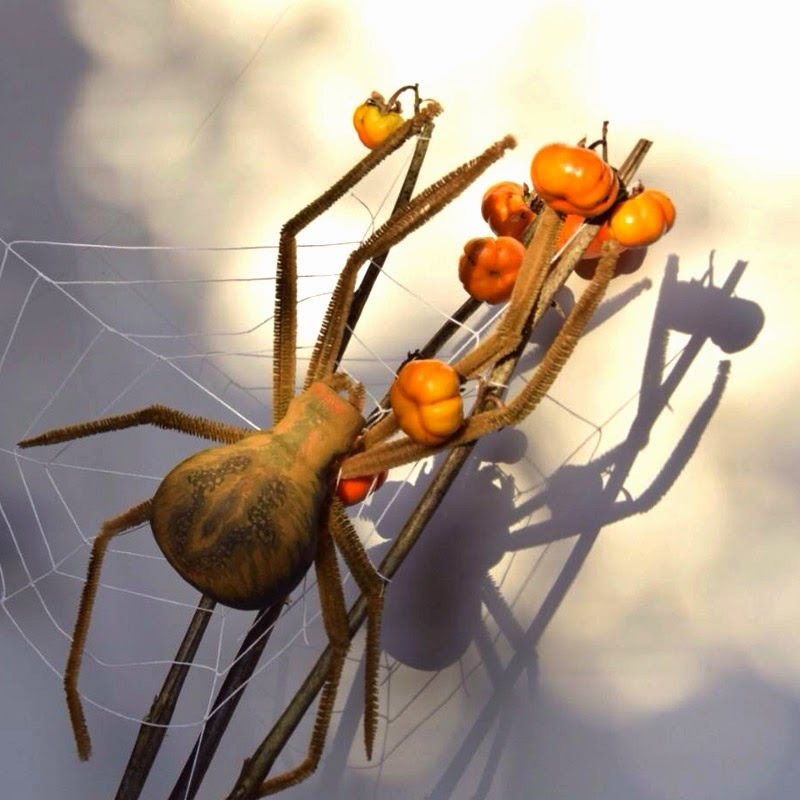 Julie took a cue from the season with this giant spider tending its web, which seems to have caught some pumpkin flowers! Talk about trading up! 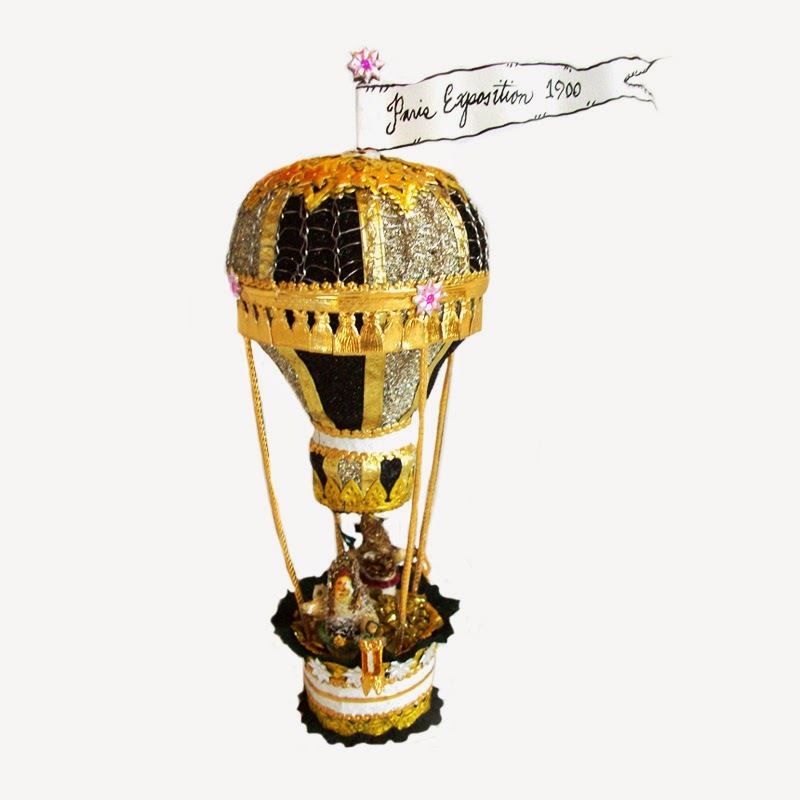 These gnomes wanted to visit Paris after hearing about the Exposition of 1900, so they bought a hot-air balloon with some of their gold. Jamie’s balloon can be hung or stood upright thanks to his Dresden-reinforced base. 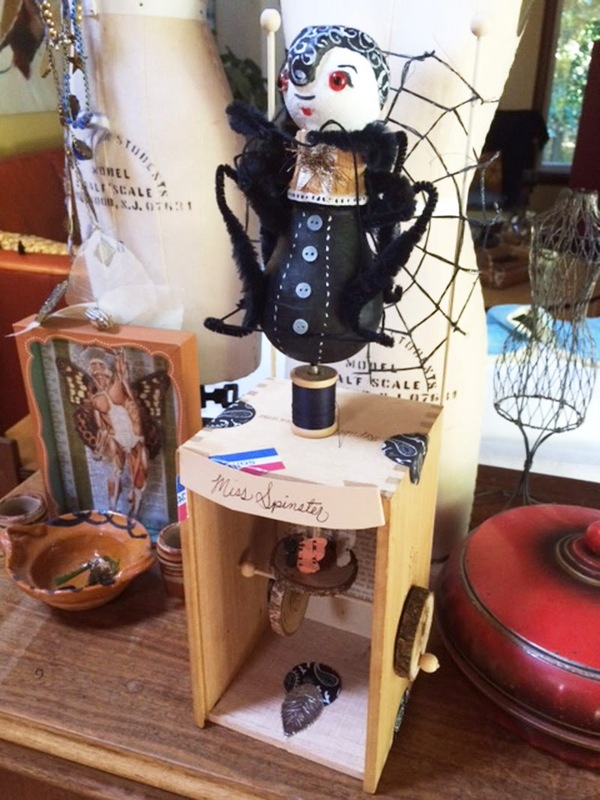 Bethany’s dapper arachnid is ready to weave a dark web from her spool of spider silk, and in fact she does spin in place when the crank on the side of her base is turned. Miss Spinster’s fuzzy pipe-cleaner legs and ornate headdress are the icing on the cake. 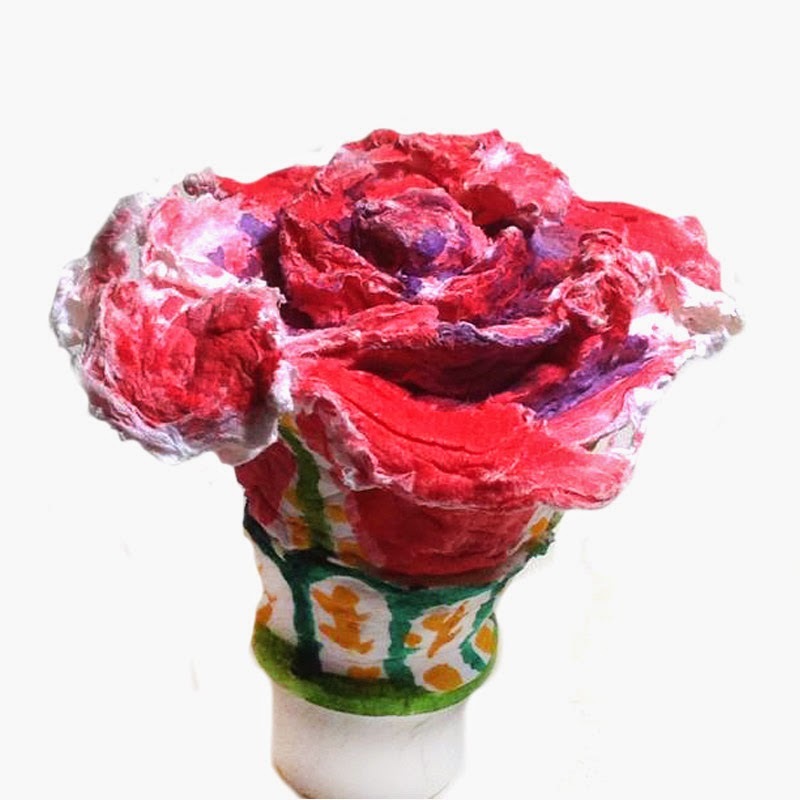 Touches of purple and white give Caskey’s rose sculpture such painterly qualities. It just bursts with life. She cut open her secret ingredient to create the rose’s folds, and it goes to show that sometimes the most beautiful part of anything is the part you can’t initially see. If Ironcraft proved anything, it’s that there is an endless variety of ways to look at a simple object. As soon as we can, we plan to post tutorials some of our entrants sent us. In the meantime, we’re sending out prizes and puzzling over the mystery ingredient for the next challenge. Thank you for being part of Ironcraft! I cannot tell you how much I have enjoyed looking at each and every entry! Oh my goodness but the Imaginations...all the wondrous and different creations from the same thing- Incredible!!! This would make a great art book. I loved making mine, and look forward to the next Ironcraft with a huge smile. Incredible! Inspiring! But also intimidating! Now that I see the level of ability and imagination, I'm not sure I would feel up to joining the next challenge! Alas! Such wonderfully talented customers you have! Great works.